Introduction: This retrospective study was designed to evaluate the immediate postoperative course and efficacy of nasal splint to prevent the formation of synechias. Objective: The objective was to compare the frequency of nasal sinéquias in-patient submitted with the nasal use of splint, as well as in relacao to the pain level. Casuistic and Methods: Eighty-two patients undergoing septoplasty including bilateral turbinate excision were allocated in two groups, one with splints and other without. Results:	Results suggests have that there was difference in the frequency of synechia between the splinted 0% and non-splinted 10,6%. However, the patients with splints had more pain and nasal discomfort than the non-splint group. Conclusion: It is suggested that the morbidity associated with nasal splints are more intense than in the patient without the splint, but it is very useful when used to prevent nasal adhesions. For a long time, intranasal adhesion development has been an important complication in the post-operative phase of nasal surgery with an incidence which varies from 10% up to 36% (1,2). In order to reduce such complications, many studies analyzed the advantages of post-operatory nasal tampon aiming at the reduction of undesirable septal defects and mainly at avoiding nasal adhesions and epistaxis (3). Nasal splints started being used 35 years ago in an attempt to keep the septal position after the surgery. Initially, they were improvised with several plastic forms, and now they are industrially produced in several forms and sizes, although a Greek study has indicated the use of wax envelope containing Fucidin (4). Probably, the best kind of splint available in the market is made of silicone, which is very beneficial due to the fact that it is made according to the patient's morphology of his/her nasal cavity. It may even receive extra side support. Its use has been increasing in the last years due to its capacity of keeping the operated septum in its position, of preventing the occurrence of epistaxis and of synechias (5). Some authors suggest its use in septoplasty surgeries associated to turbinectomy to prevent synechias after the surgery (6,7). Some studies bring considerations which indicate that the efficiency of nasal splints may be low if compared to simple procedures such as nasal toilet and tampons (8). An increase in morbidity has also been observed associated to the procedure such as anxiety of device removal, pain, discomfort and some cases involving the toxic shock syndrome (9). Our study is retrospective for the evaluation of synechia frequencies with the use of Nasal splint, compared with the synechia frequencies after the surgery in nasal surgeries with and without splint, as well as the evaluation of groups in terms of pain level. To compare the synechia frequencies after the surgery in nasal surgeries with and without splint, as well as the evaluation of groups in terms of pain level. This study was duly registered at SISNEP (Sistema de Informação Nacional sobre Ética em Pesquisa) [National Information System concerning Ethics on Research] of Universidade Santo Amaro under registration number 182/2007. Medical records of patients who underwent surgical treatment at Otorrhynolaryngology Discipline at Hospital Geral do Grajaú da Faculdade de Medicina da Universidade de Santo Amaro (UNISA) and treated in the HEWA Otorrhinolaryngology clinic, in the Southern region of São Paulo city, between January 2003 and January 2004 were retrospectively analyzed. Data were raised in standard protocol and transcribed for the computer program Epi. Info 6.0 for complementation of statistical analysis. 82 medical records of patients who underwent septoplasty with inferior bilateral turbinectomy were reviewed, who were randomly placed in 2 groups, one with nasal splint and the other without nasal splint. Out of such patients, 47 were submitted to such procedure and were not treated with the placement of nasal splint, and the other 35 patients were treated with the placement of nasal splint which was previously sterilized in autoclave. The splint used is made of plastic which comes from plastic recipients of saline solution, all sterilized in autoclave. Such splint is always bilaterally molded during the surgery by the assistant. The patients returned to the clinic on the second day after the surgery for the removal of the bilateral anterior nasal tampon, on the seventh day for the removal of nasal splint, once a week until reaching the first month for secretion aspiration and crust removal, bimonthly on the second month for cleaning and being discharged on the third month. All patients submitted to surgery were kept with antibiotics (amoxicilin), 500 mg VO TID for 10 days and nasal shower with 0.9% saline solution until discharge. For result analysis we applied the qui-square test and Fischer Exact Test, in order to compare the groups with and without splint in relation to the level of pain and synechia presence. Patients who underwent this study had a continuous treatment, during which date related to pain and discomfort were gathered. For patient pain analysis a table with values varying from 1 to 10 was elaborated in order to indirectly measure the pain felt by such patients during the first 48 hours. 1 to 3 was considered mild pain, 4 to 7 moderate pain and 8 to 10 intense pain (Table 1). In the group without nasal splint we observe a higher frequency of moderate pain (70.2%) when compared to the group with Splint (65.7%). In the group with nasal splint we observe a higher frequency of intense pain (22.9%) when compared to the group without Splint (2.1%). Concerning the synechia frequency, patients who were treated with the use of nasal splint did not present post-surgical synechias (0%), while patients treated without nasal splint presented a 10.6% post-surgical synechia frequency. The Fischer test did not present significance (P = 0.056). A patient who belonged to the group treated without nasal splint needed a second surgical procedure, once both nasal fossae were closed by relevant synechias which were not possible to be undone in the ambulatory. Our study shows that the nasal splint increases co-morbidities such as pain and discomfort in the post-surgical period. On the other hand, it presented high efficiency to prevent post-surgical synechias once any of the patients who underwent the septoplasty with turbinectomy and who were treated with nasal splint evoluted with post-surgical synechia. Even not reaching the significance level, results suggest association between synechia presence in the group without nasal splint. Synechia is an adherence between the nasal septum and the inferior nasal concha which may cause nasal obstruction. In order to avoid such adhesions, nasal splints have been created, which are devices more and more used, as a British study demonstrates, which shows 64% of United Kingdom's doctors' offices using the nasal splint in order to avoid synechias formation. Our patients have been divided in two groups. The first one was treated with nasal splint (plastic), previously sterilized in autoclave, and the second one without nasal splint. 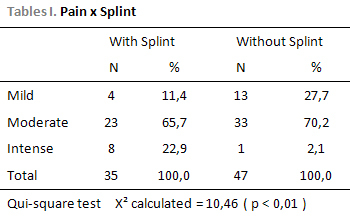 Pain observed in the group treated with nasal splint was higher than the pain observed in the group treated without splint (Table 1). Such fact may be explained by the presence of transeptal point of splint fixation whose removal followed by symptoms reduction confirms such hypothesis. All patients referred nasal obstruction sensation and important runny nose, maybe due to the foreign body sensation caused by the splint in the nasal fossae. Post-surgical sinusitis did not occur due to prophylaxis with 500mg amoxicillin VO TID for 10 days after the surgical procedure. In 1988, some authors proved the increase of synechia incidence in septoplasties when associated to turbinectomy presenting a 36% rate (2). The use of nasal splint is only justified when it really presents advantages to the patient (7). The use of tampon in detriment of nasal splint in septoplasty surgeries associated to turbinectomy presents 11% nasal synechia incidence after 6 weeks (1). The morbidities associated to nasal splint placement do not justify its frequent use as an intention to prevent synechia formation, but must be indicated if there is a purpose of keeping the stability of nasal septum after a septoplasty (10). 1. Shone GR, Clegg RT. Nasal adhesions. Journal of Laryngology and Otology, 1987,101:555-57. 2. White A, Murray JA. Intranasal adhesions formation following surgery for chronic nasal obstruction. Clinical Otholaryngology, 1988, 13:139-43. 3. Guyuron B. Is packing after septorhinoplasty necessary? A randomized study. Plastic Reconstr Surg,1989, 84(1):41-44. 4. Eliopoulos PN, & Phillippakis C. Prevention of post-operative intra-nasal adhesions (a new material). J. Laryngol. Otol., 1989, 103:664-66. 5. Cook AC, Murrant NJ, Evans KL, Lavelle RJ. Intra-nasal splints and their effects on intra-nasal adhesions and septal stability. Clinical Otolaryngology, 1992, 17:24-27. 6. Gilchrist AG, Surgery of the nasal septum and pyramid. J. Laryngol. Otol. , 1974, 88:759-71. 7. Campbell JB., Watson MG & Shenoi PM. The role of intranasal splints in the prevention of post-operative nasal adhesions. J. Laryngol. Otol., 1987, 101:1140-43. 8. Von Schoenberg M, Robinson P, Ryan R, The morbidity from nasal splints in 105 patients. Clinical Otholaryngology., 1992,17:528-30. 9. Wagner R, Toback JM, Toxic shock syndrome following septoplasty using plastic nasal splints. Laryngoscope, 1986, 96:609-10. 10. Malki D, Quine SM, Pfleiderer AG, Nasal splints, revisited. The Journal of Laryngology and Otology., 1999, 113:725-27. 1. Medical resident doctor on Otorrhinolaryngology. 2. Otorrinolaryngologist. Otorrhynolaryngology Professor at Faculdade de Medicina de Santo Amaro. 3. Doctor's Degree on Otorrinolaryngology. Otorrhynolaryngology Chief Professor at Faculdade de Medicina de Santo Amaro. 4. Doctor's Degree on Otorrinolaryngology. Otorrhynolaryngology Chief Professor at Faculdade de Medicina de Santo Amaro. This article was submitted at SGP (Publication Management System) of R@IO on October 4, 2007 and approved on January 23, 2008, 18:36:45.